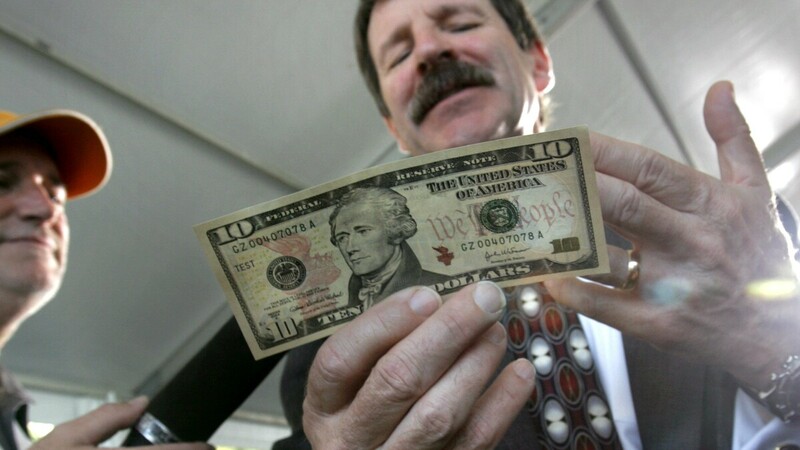 Woman To Share Marquee On $10 Bill With Alexander Hamilton : The Two-Way A redesign of the denomination will add the portrait of an as-yet-undetermined famous American woman beginning in 2020. Alexander Hamilton is currently on the $10 bill. Alexander Hamilton, who has had top billing on the $10 since 1929, will have to share the marquee starting in 2020, making way for a woman's portrait — but it is not yet clear who will get the honor. "America's currency is a way for our nation to make a statement about who we are and what we stand for," Treasury Secretary Jacob Lew said in a statement on Wednesday. "We have only made changes to the faces on our currency a few times since bills were first put into circulation, and I'm proud that the new 10 will be the first bill in more than a century to feature the portrait of a woman," he said. As the AP reports: "Lew is asking the public for suggestions on who should be chosen for the bill, as well as what symbols of democracy it should feature. Ideas can be submitted by visiting thenew10.treasury.gov website." NPR's Sam Sanders reports that efforts to get a woman on U.S. currency have been building. And, as the Two-Way's Bill Chappell reported last month, in an online petition, former slave and abolitionist Harriet Tubman beat out Eleanor Roosevelt, Susan B. Anthony, Sojourner Truth and others. President Obama last year mentioned the movement during a Kansas City speech: "Last week a young girl wrote to ask me, 'why aren't there any women on our currency?' and then she gave me like a long list of possible women to put on our dollar bills and quarters and stuff." According to a Treasury Department FAQ on the redesign: "Secretary Lew has made clear that the image of Alexander Hamilton will remain part of the $10 note. There are many options for continuing to honor Hamilton. While one option is producing two bills, we are exploring a variety of possibilities. However, security requirements are the driving consideration behind any new design." "The announcement comes a month after a grass-roots campaign was launched to remove Jackson — a slave owner infamous for the forced relocation of the Cherokee tribe — from the $20 bill and replace him with a woman. "Sen. Jeanne Shaheen (D-NH) even sponsored a bill to boot Jackson. But Wednesday night, she said she was also happy to dump Hamilton." "'While it may not be the 20- dollar bill, make no mistake, this is a historic announcement,' Shaheen said. 'Young girls across this country will soon be able to see an inspiring woman on the 10-dollar bill.'"